We're featuring this article that's more than a year old because Jack recently discovered that he suffered from drug-induced Parkinsonism, and not the Parkinson's Disease with which he'd been diagnosed. Several weeks after eliminating the offending drug(s), his symptoms have either disappeared or greatly improved, and he feels 100% better. WASHINGTON, D.C. – A new article published in WorstPills.org highlights the widespread nature of drug-induced Parkinsonism and the need for patients and doctors to be aware of the potential to be misdiagnosed. The article includes a list of 49 prescription drugs known to cause drug-induced Parkinsonism. Recent information has established that as many as one of every 10 people who went to a Parkinson’s disease center were found to have drug-induced Parkinsonism, not the more serious disease it is often mistaken for. The people were misdiagnosed as having the more common illness, Parkinson’s disease, which is irreversible and has unknown causes. Drug-induced Parkinsonism, however, is reversible and is brought on by medication use. This means that instead of suspecting a drug-induced origin and stopping the offending drug, doctors may mistakenly treat drug-induced Parkinsonism with another drug — as though they were treating Parkinson’s disease — while leaving the patient on the drug that caused the illness in the first place, Wolfe said. Aging can make one prone to drug-induced Parkinsonism, and older people may be especially sensitive to drug-induced Parkinsonism from antipsychotic drugs. Also, almost 100 percent of people infected with HIV will get drug-induced Parkinsonism if given antipsychotic drugs, the article said. • No degeneration in the brain (Parkinson’s disease causes brain degeneration in a specific area). Worst Pills, Best Pills, a monthly newsletter published by Public Citizen that offers an unbiased analysis of information from a variety of sources, is available in print and electronic formats at www.WorstPills.org. The site has other searchable information about the uses, risks and adverse effects associated with prescription medications. Note: WorstPills.org is a subscription site. The cost is $15 for a one-year subscription. almost ended up on a shelter’s kill list. Dan Sauer doesn’t want or need your sympathy. 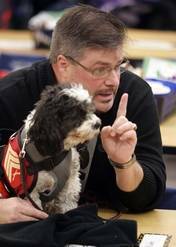 The 42-year-old Hampshire resident and former Marine sergeant is only discussing his service dog, Chloe, to educate the public and to raise awareness for soldiers coming up behind him who could benefit from having such an animal. Sauer, a disabled veteran who was in the service for eight years, spent nearly 10 months in Kuwait during Desert Storm and was diagnosed with post-traumatic stress disorder 13 years ago. During the war, Sauer suffered a traumatic brain injury from a mortar round that also tore the retina in his left eye, damaged a fingernail on his left hand and affected his memory. Sauer’s experience overseas and PTSD made him bunker down at home and avoid people. For years, he didn’t seek treatment for PTSD. Chloe, 3, isn’t your typical service dog. Many people, used to seeing bigger dogs doing the job, mistake the 17-pound, black-and-white Bichon-poodle-shih tzu mix for a pet — even with her red service dog vest. And she doesn’t always enjoy the same level of acceptance as a German shepherd or a golden retriever — pooches people generally associate with service work. When they’re out and about, Sauer and Chloe get curious glances, questions and the occasional rude comment from the public. For example, as soon as Sauer entered a store in Belvidere with Chloe, the manager came over and said, “Oh, no,” to Sauer and pointed to the exit door. Chloe’s job is to sense when Sauer is aggravated, angry and stressed then to distract him from those feelings and keep him in check by forcing him to pay attention to her. For example, Sauer has nightmares every night about combat. When he’s having a nightmare, Chloe, who usually sleeps with him, will feel his legs twitching and nudge and cuddle with him to wake him up. He’ll pet her, and that will take his mind off the nightmare and help him get back to sleep. If Sauer feels irritated at any point during the day, all he has to do is order Chloe to “lay,” and she’ll jump up on him and press her body into his while he strokes her, putting him in his happy place. She also protects Sauer’s personal space by standing between him and other people. Read more about Dan Sauer and Chloe here. On this day when we pause to think about what we have to be thankful for, we are humbled by our blessings. I have to admit I read that headline more than once, and the article too. Sounds like another instance of truth being stranger than fiction. Meet Silbut, a robot designed to ward off Alzheimer's disease. It's running a sing-along class and asking the attendants to fill in the blanks of the lyrics. Another robot dubbed Mero tells a story making various and subtle facial expressions. It gives compliments for correct answers and even makes jokes. All of you here today look so nice. You're also good at answering the quizes. This is a pilot class for training the brain using robots developed by the Korea Institute of Science and Technology. The aim is to prevent dementia by stimulating the brain with games. "Due to aging, I tend to forget things a lot these days. I was wondering what I could do to prevent that and having tried this program, I think it's great." At the moment, there are 16 games developed for seniors in their 60s to 70s. They are specifically designed to stimulate the three areas of the brain that are in charge of decision-making, making calculations and storing memory. Under the program, these participants will take an evaluation test in December which marks the third month of training. The test results will be used to determine the level of progress in cognitive ability. Recently, the authorities have sent 8 robots to Finland and Denmark after signing a collaborative agreement. And after a local three-month program and assessment, hopes are high that the Korean-made robots will make inroads into the overseas market. "The robots are cost-effective and productive. For instance high skilled workers would not be able to go and care for seniors in remote areas. In such cases, robots could take their place." As the next project, KIST plans to develop robots for the specially challenged children and for science education. Linda Cope is well known to those in Bay County for her work as founder and president of the Warrior Beach Retreat Inc.
She also has been stumping for new treatments to aid wounded warriors in their recovery. Cope testified last week before Congress in support of a proposal to allow the military to pay for hyperbaric oxygen therapy for brain injuries. She said her testimony went well and was backed up by doctors and former military officials. The U.S. has used hyperbaric treatments for injuries but not brain injuries. Cope said her oldest son, Sgt. Joshua Cope, lost both his legs in an “improvised explosive device” blast on Nov. 12, 2006, and has undergone hyperbaric oxygen therapy. It has helped her son, she said. “It is usually 40 treatments for about an hour a day, five days a week,” Cope said. Hyperbaric oxygen therapy involves breathing pure oxygen while in a sealed chamber that has been pressurized at up to three times normal atmospheric pressure, according to the American Cancer Society. The most recent bill regarding this issue, HR 4568, sponsored by U.S. Rep. Pete Sessions, R-Texas, was attached to the House Armed Services bill and a companion provision was attached to the Senate Armed Services bill. Cope is asking the public to contact their congressional representatives in Washington D.C. to help push the legislation forward. She also noted that President Barack Obama is in favor of the bill. The U.S. Marines are currently testing hyperbaric chambers for brain injury treatment in California. During a Senate Armed Services Committee hearing earlier this year, military officials told Armed Services Chair U.S. Sen. Carl Levin, D-Michigan, that hyperbaric oxygen therapy had been working for brain injured veterans. One study has shown that since 2004 over 70 percent of the casualties of improvised explosive devices in Afghanistan have been traumatic brain injuries. Receiving a diagnosis of dementia increases a person's risk for suicide, particularly if symptoms of depression and anxiety are present, a new study finds. There is growing evidence that depression and anxiety are more likely to occur early in the course of dementia, which may drive suicidal behavior, Lisa S. Seyfried, MD, from the Department of Psychiatry, University of Michigan, Ann Arbor, and colleagues note in an article published in the November issue of Alzheimer's & Dementia. "Timely identification and intervention addressing the complex issues of depression and dementia in these patients may help to mitigate their increased risk," they say. "I think that we have to start conceptualizing dementia in a similar way to cancer," Professor Brian Draper, MBBS, MD, FRANZCP, from the School of Psychiatry, University of New South Wales, Sydney, Australia, who was not involved in the study, told Medscape Medical News. "They are both severe, life-threatening illnesses. The shock, or in many cases the confirmation of worst fears that one has Alzheimer's disease, can be a psychological challenge that some find insurmountable, and depression is a common postdiagnosis reaction," he explained. "Some are already mildly depressed at the time of diagnosis. It is usually in that context that suicidal behavior occurs in the early months after diagnosis. A similar pattern is noted after cancer diagnosis, even when the prognosis might not be too bad," Dr. Draper said. Continue reading (might have to register for a free account). Depression is one of the most common mental disorders in the elderly, but little is known about the underlying biology of its development in older adults. Tresearchers from the University of California, Los Angeles (UCLA) used a brain scan to assess the levels of amyloid plaques and tau tangles in older adults with major depressive disorder, also known as clinical depression. Previous research has suggested that plaque and tangle deposits in the brain — hallmarks of Alzheimer’s disease and many dementias — are associated not only with memory loss but also with mild symptoms of depression and anxiety in middle-aged and older individuals. The team wanted to see what the brain-scanning technique would find in older people with depression. The researchers created a chemical marker called FDDNP that binds to both plaque and tangle deposits, which can then be viewed through a positron emission tomography (PET) brain scan, providing a “window into the brain.” Using this method, researchers are able to pinpoint where in the brain these abnormal protein deposits are accumulating. The scientists compared the FDDNP brain scans of 20 older adults between the ages of 60 to 82 who had been diagnosed with depression with the scans of 19 healthy people of similar age, education and gender. ...Researchers also found that similar protein deposit patterns in the lateral temporal and posterior cingulate areas in patients were associated with different clinical symptoms. Some patients demonstrated indicators of depression only, while others also displayed symptoms of mild cognitive impairment. Dr. Small noted that previous research has shown that depression may be a risk factor for or a precursor to memory loss, such as mild cognitive impairment, which can later lead to dementia. “We may find that depression in the elderly may be an initial manifestation of progressive neurodegenerative disease,” said the study’s first author, Dr. Anand Kumar, the Lizzie Gilman Professor and department head of psychiatry at the University of Illinois at Chicago. When Darla Arni's mother began showing the first signs of dementia 16 years ago, Arni worried she was doomed to the same fate. So Arni began reading up on what she could do to stay mentally sharp. Turns out, plenty. Arni, now 55, grew up on a farm where her mother fried just about everything in lard. Today, she skips the fried foods and eats plenty of fruits and vegetables, takes fish oil pills, goes for regular walks and meditates during a weekly yoga class. "I'm doing everything I can," says Arni, a public speaker and author who lives in Slater, Missouri. Doctors who specialize in the aging brain say that dementia is not inevitable, even in very old age. Making positive lifestyle changes earlier in life, they say, can lessen the chances of the faulty thinking and flagging memory that often come with advancing years. Dr. Gary Small, director of UCLA's Longevity Center, says lifestyle may play a bigger role than genetics when it comes to who will fall into what he calls the "mental fog" of dementia. Alzheimer's is perhaps the best known and most feared form of dementia. Early onset Alzheimer's disease, which often has a strong genetic component, may not be delayed with any lifestyle changes. But late-life Alzheimer's, affecting people in their 80s and 90s, has only a minor genetic component and can be delayed or prevented with lifestyle changes -- especially if the changes begin in midlife, says Dr. Majid Fotuhi, chairman of the Neurology Institute for Brain Health and Fitness and a neurology professor at Johns Hopkins University School of Medicine. Fotuhi began ballroom dancing when he was a student at Harvard Medical School. It was a break from all the studying. More than that, it was fun. Now a neurologist, Fotuhi still dances. He and his wife, Bita, have mastered the tango. As an expert on how the brain ages, Fotuhi sees another benefit: Dancing is the perfect activity to keep the brain young. "When people say, 'What's the one thing I can do?' I say, 'Dance.' " Fotuhi says. The answer to keeping the brain sharp, neurologists agree, is not sudoku or crossword puzzles -- despite the conventional wisdom. Staying physically fit is the most important element to keeping the brain young later in life, they say. Remaining socially engaged and mentally active in new and challenging ways are the two other components to long-term brain health. Fotuhi says ballroom dancing is perfect because it combines physical activity, social interaction and the mental challenge of remembering the steps. Lumosity is a fascinating site. We've written about it before. The site partners with researchers at Stanford, UCSF, Harvard, and Columbia, among other prestigious universities, and also works with numerous health care organizations to provide cognitive training services. Earlier this year, Lumosity introduced The Human Cognition Project, our groundbreaking effort to bring together scientists from 25 of the top neuroscience programs in the world. We'd like to take this moment to remind our members of the flurry of scientific activity going on behind the scenes. Collaborators from institutions such as Stanford, Berkeley and Harvard are all pitching in with their own research projects, contributing towards the larger goal of crafting the most effective cognitive training programs in the world. There are over 35 research projectsrunning right now. Members who play our games may not realize how much research, development, and testing goes on behind the scenes. We share our database on human cognition—the largest in the world—with university partners in order to broaden the scope of research possibilities. Researchers are actively exploring data collected from 15 million Lumosity users to better understand the determinants of cognitive performance and cognitive enhancement — all in an effort to make the world a smarter place. Make sure you're a part of The Human Cognition Project: subscribe now to train with all 35+ games and donate your data to the scientific community! Although subscriptions cost a reasonable amount, if you can't pay to play right now, the Lumosity site also has several brain games you can play for free. Well worth a visit. You can learn more at the Lumosity blog. This goes right along with Jack's revelation that the side effects of medications are often worse than the condition the medication is supposed to treat. He has also discovered an alarming number that can cause cognitive decline, a major worry for anyone who's already suffered a traumatic brain injury. After having a local university's School of Pharmacy study the list of 17 medications Jack was on and reading their report, he slowly began weaning himself off of most of them. He now takes just two. Jack worked with his doctors on this, although not all of them were in agreement. In the end it was Jack's choice, and it might not be the right one for everybody. The difference for Jack, however, has been amazing. He feels a lot better, feels more in control of his mental and emotional state, and now worries about all the other people being made sick by their prescribed medications. Antidepressant medications may not be more effective than placebos in the treatment of depression in older adults who also have dementia, and the risks of antidepressant treatment may outweigh the benefits, particularly if the depression is not severe, according to two studies published this year. Between 20 percent and 40 percent of people with dementia experience a diagnosable depressive disorder, nearly half major depression. This condition not only can be painful, it also increases risks of physical illness, disability and premature mortality. (3) In addition, it often results in decline in cognitive and functional capacity over and above the decline that results from dementia alone. Depression appears to have a particularly negative impact on "instrumental activities of daily living," including preparing meals, housework, managing finances, shopping, caring for others, etc. Clearly, overcoming depression is important for people with dementia. But, recent studies have failed to demonstrate that antidepressants improve depression more than the attention received by participating in a research study. One study, done with the support of the British National Health Service to evaluate the standard approach to treating depression in people with dementia, showed no benefit of antidepressants compared to placebos but did show more adverse side-effects. For this reason the authors strongly recommend a change in the standard treatment approach. Instead of starting with an antidepressant, they suggest that the first step should be "watchful waiting" while helping people with dementia and their caregivers to cope better with the difficulties typical of living with dementia. They suggest that many depressive episodes in dementia patients may resolve on their own. If not, psychotherapy provided by a specialist may help. The authors maintain that antidepressants should be reserved for depression that is severe or persistent. Deaths from Alzheimer's disease and dementia are steadily rising in England and Wales, as cancer, heart attack and stroke deaths gradually come down. The latest figures from the Office for National Statistics (ONS) show an 11.7% rise in dementia deaths in the last year, 2009-10, to a total of 25,106. More than two-thirds – 18,349 – were of women, in part because they live longer than men. Alzheimer's and dementia are now the third leading cause of death for women, after heart disease and stroke. Falls in other, more preventable and treatable diseases are largely responsible for a 26% rise in dementia deaths over the five years between 2005 and 2010. In the same period, heart disease deaths dropped by 30% in women. Diseases of the urinary system – also linked to old age – increased by 8.1% in that time and lung cancer deaths rose by 3.5%, as smoking continued to take its long-term toll, but most other trends were down.